A young commercial date palm planting in California’s Coachella Valley. Dates have a high nutritional value and are a staple in the diets of many Middle Eastern and North African countries. How can a thick-skinned, dried-up piece of fruit be so beloved? Well, it comes from one of the most tenacious plants in nature. It’s a key food source for millions living across the Middle East and North Africa. And the trees bearing it have been thriving alongside some of world’s most ancient rivers for thousands of years. But the date palm, with its dense, sweet fruit, is even more than that. For many generations of Egyptians, it’s been viewed as a symbol of fertility, sprouting up almost miraculously along rivers and oases in the region’s driest deserts. The tree has been depicted in bas relief, on monuments, and on coins. Its shape is even thought to have inspired a style of columns in Greek architecture. Thanks to the curiosity of some turn-of-the-century plant explorers, the southwestern United States now boasts its share of the trees. In the early 1900s, date palms were brought to southern California because the climate in its desert region seemed ideal for growing them. There, the regal trees—with their swaying, feathery fronds—are valued not just for their sugary crop, but also for their attractive foliage. Ripening fruit of Deglet Noor, a commercial date variety commonly grown in the United States, Egypt, and other countries. Unfortunately, not even the most revered cultural icons are impervious to harm. According to the United Nations Food and Agriculture Organization, the future of date palms is uncertain. Serious problems hamper their cultivation, including low yields, damaging insects, and a lack of research. In Iraq—the tree’s birthplace—war and neglect are taking their toll. The country’s date industry, which once peaked at 30 million cultivated trees in the 1960s, has dwindled to 13 million. But help for this ancient tree is coming. Researchers, including ARS horticulturalist Robert Krueger, are beginning to inventory the world’s date plants—one of the first steps towards ensuring their conservation. Krueger works at the National Clonal Germplasm Repository for Citrus and Dates in Riverside, California—a collection of seeds, pollen, and trees managed by ARS and the University of California (UC). Krueger was contacted by researchers in Egypt who wanted to learn more about that country’s date diversity. After all, dates are a crucial part of the country’s economy; Egypt is the world’s top producer, having grown the trees since 3200 B.C. The genetic study was also supported and funded by the U.S.-Egypt Joint Science and Technology Board, established to help promote scientific collaboration between the two countries on research projects of mutual interest. For the project, Krueger and Egyptian colleague Ashraf El-Assar—in collaboration with UC-Riverside colleagues C. Thomas Chao and Devanand Pachanoor—sorted through dozens of date palm accessions from all over Egypt. They wanted to find out whether the dates were close cousins, distant relatives, or unique. The future of date cultivation—including a capacity to counter new plant diseases and pests—depends on access to a diverse gene pool. The researchers basically constructed a date palm family tree and identified those plants whose genetic material was most similar. Eventually, they ended up with about five distinct families, one of which was much larger than the rest. “This group or cluster of date palms may represent the original gene pool that moved from the plant’s center of origin to North Africa,” says Krueger. That center is thought to lie within the geographic confines of Iraq. Ideally, the researchers would like to compare the genetic make-up of the Egyptian dates to dates growing in Iraq to confirm their ancestral ties, but because of current international conditions, such exploration is infeasible right now. There was another significant finding regarding that large cluster of related date plants. The researchers discovered that one of the most popular and widely cultivated varieties, Deglet Noor, falls in this group. Desired for its plentiful, semisweet fruit, Deglet Noor is also the date most likely to be eaten by Americans. 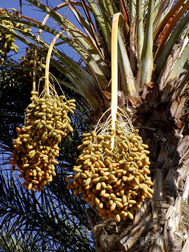 Thanks to findings revealed by the joint ARS-Egypt study, the date industry now knows it can tap the four other Egyptian date palm genetic clusters as sources of germplasm to help diversify the important crop. Americans are most likely to encounter the naturally sweet, chewy date in cereals and fruit bars. These high-calorie fruits are a superb energy source, and they’re packed with more cell-protecting antioxidants than most other fruits and vegetables. But despite these impressive health benefits, Americans aren’t eating their dates. Of the six, the researchers found that Deglet Noor dates were the best at scavenging free radicals. Krueger says a handful of these amber-colored, semisoft fruits has about the same antioxidant activity as a half-glass of red wine. But he points out that he and Kader have just scratched the surface: Who knows what good-for-the-body chemicals are hiding inside the thousands of other date varieties growing around the world. Today, only about 6,000 acres of date palms are grown in California’s sun-drenched desert valleys of Coachella and Bard. “More date palms are probably grown in the small country of United Arab Emirates than are grown in the entire United States,” says Krueger. Maybe more Americans will start munching on dates once they hear about the fruit’s health-promoting properties—as well as its vivid past.—By Erin K. Peabody, Agricultural Research Service Information Staff. To reach scientists mentioned in this article, contact Erin Peabody, USDA-ARS Information Staff, 5601 Sunnyside Ave., Beltsville, MD 20705-5129; phone (301) 504-1624, fax (301) 504-1486. "Dates To Remember" was published in the July 2006 issue of Agricultural Research magazine.